The button to add a new calendar is not directly accessible. You have to click on the "three dots". go to top left corner where it says "Calendar"
There is a button "+" between "Calendar" and the 3 dots in the top left corner, so you can add a new calendar immediately. Other (less often used) functions can be found by clicking on the 3 dots. I could find an "add calendar" button. Anyone else? I think it's fine the way it is. You need the three dots for some things, if you have everything accessible right a way, that would be too much, and I do not think people need to add a new calender very often, so for me it's fine if I have to click on the three dots first. so we delete this task? If Ben says it's ok. He created the ticket, don't know if he has some good arguements? I would maybe just change it a little. The three dots are usually used on smartphones, so it is known that there are more functions available. But there could be a + button for adding another calendar? Do you want the plus button next to the dots or instead of them? i`d put it next to it. 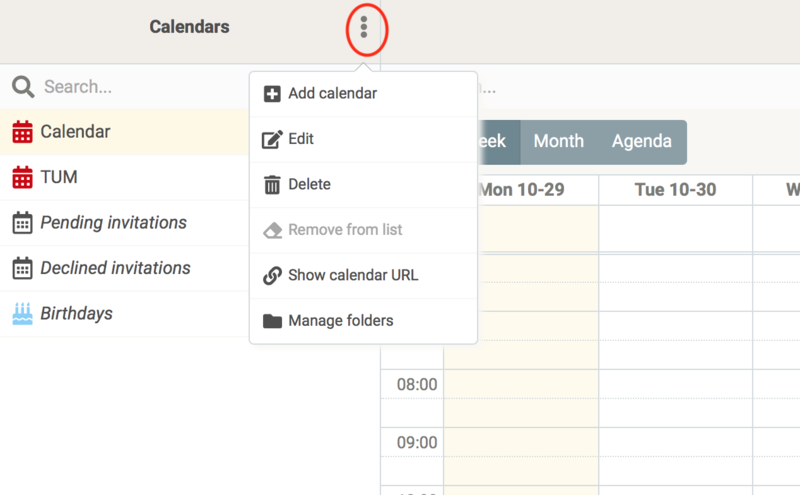 So you can add a calendar immediately but have the other functions summarized under the three dots. Then change the description and put it to done?! I changed the description. Put it to done?